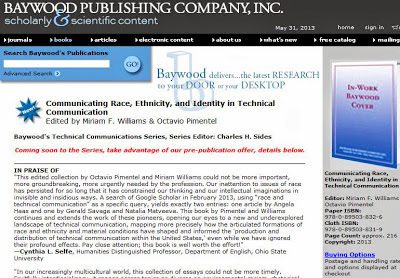 I have a chapter in this edited collection on intersection of technical communication and race that is forthcoming from Baywood Publishing. The purpose of this book is to move our field’s discussion beyond issues of diversity in the practice of technical communication, which is certainly important, to include discussions of how race and ethnicity inform the production and distribution of technical communication in the United States. Equally important, this book is an attempt to uncover those communicative practices used to adversely affect historically marginalized groups and identify new practices that can be used to encourage cultural competence within institutions and communities. This book, like our field, is an interdisciplinary effort. While all authors have taught or practiced technical communication, their backgrounds include studies in technical communication, rhetoric and composition, creative writing, and higher education. For the sake of clarity, the book is organized into five sections: historical representations of race and ethnicity in health and science communication; social justice and activism in technical communication; considerations of race and ethnicity in social media; users’ right to their own language; and communicating identity across borders, cultures, and disciplines. Intended Audience: Graduate students, professors, and practitioners in technical communication, rhetoric and composition, and other areas of English studies.